Journal of Oral Implantology –Implant dentistry practitioners are increasingly seeing more difficult cases of implantation in which they must first overcome insufficient bone volume within the upper and lower jaw. These types of difficult cases have led to new surgical techniques, such as utilizing titanium mesh to assist in guided-bone regeneration. While this technique can lead to a successful implant procedure, the use of titanium mesh has been known to cause complications in some patients. Researchers from Loma Linda University, King Saud University (Saudi Arabia) and Imam Abdulrahman Bin Faisal University (Saudi Arabia) recently published a study in the Journal of Oral Implantology that introduces a new method for treating exposed titanium mesh. Through four case studies, the researchers show that by removing the exposed titanium mesh and leaving the remainder to continue the regenerative process, dental implantation can be more effective and successful. Between 2015 and 2017, four patients were treated with titanium mesh. The patients were between the ages of 27 and 50, and each had two previously failed bone regenerative procedures. In all four cases, the surgical technique used to incorporate the titanium mesh with the bone graft was the same; however, each patient received a different type of material or membrane to cover the titanium mesh. Each patient also experienced mesh exposure at a different rate, ranging from one to six weeks post-operation. The exposed mesh was removed between four and ten weeks after exposure occurred. The remaining titanium mesh was removed approximately six months after insertion and one to two months prior to dental implantation. In all four cases, the researchers found that by removing the exposed titanium mesh and allowing the rest to remain, the bone volume reached a level that was adequate for dental implants. Another benefit of exposure removal was the creation of a more hygienic space for the implant. Caring for areas with exposed mesh caused difficulty and discomfort for patients, compromising the integrity of the regenerative site. 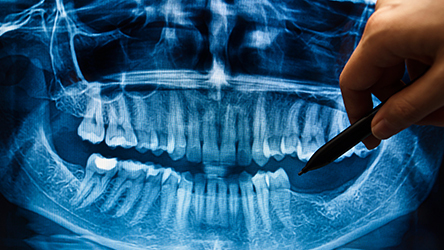 The researchers acknowledge that their technique has been successful and helps ensure proper bone regeneration and hygiene maintenance for dental implant surgery, but that further analyses are necessary. Before this technique can be carried out in routine dentistry, more clinical research with a greater number of patients is needed. Full text of the article, “Managing Titanium Mesh Exposure With Partial Removal of the Exposed Site: A Case Series Study,” Journal of Oral Implantology, Vol. 43, No. 6, 2018, is available at joionline.org/doi/full/10.1563/aaid-joi-D-17-00169.